Tay Ninh: "Towers and Temples"
Please click on the image for photos of Tay Ninh: "Towers and Temples"
On my flight from Bangkok to Ho Chi Minh City, I met Mi, a lovely young woman who was returning home from a business trip. Mi owns the Cara Nguyen Fashion Design Company. I called her and she invited me for lunch. I met Mi and her sisters at a beautiful restaurant. We consumed a remarkable amount of food and had a great time. Since Mi was busy with her business, she suggested that her sister be my unofficial tour guide for the day. Sounded good to me. Thao hailed the taxis. 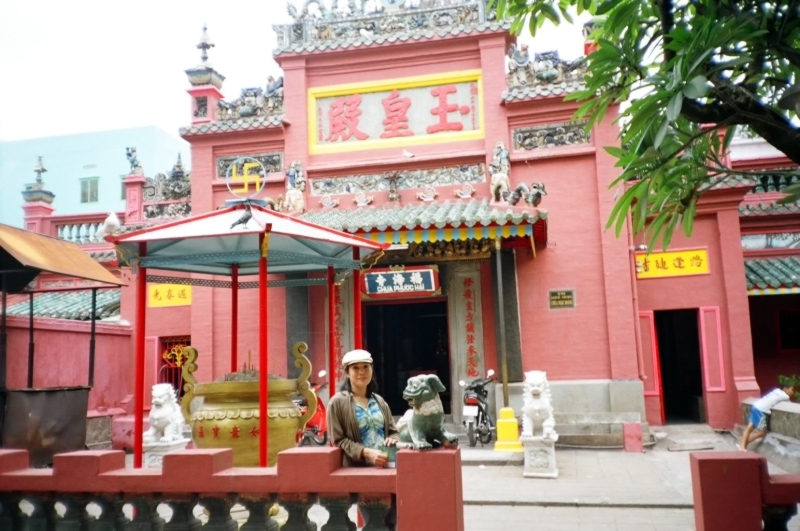 I had a long list of Chinese temples, pagodas and museums. In addition to the Buddhist sculptures that reminded me of Thailand, I had my introduction to Chinese Taoist statues of "phantasmal divinities and grotesque heroes." I climbed the multi-level pagodas to find colorful carvings and statues and a grand view of the city. We visited several pagodas, a Buddhist cemetery, a museum and a large park. Poor young Thao. She was exhausted. That evening I had a couple of drinks at a neighborhood bar with another new friend, Junko, from Japan. She was also on a business trip, buying handicrafts for her shop at home. The bar had a Country & Western theme. The music was loud. The beer was cold. I booked a tour to the Caodai Temple in Tay Ninh, a long ride from HCMC. The guidebook says, "The Great Temple is one of the most striking structures in all of Asia. Built between 1933 and 1955, the temple is a rococo extravaganza combining the perhaps conflicting architectural idiosyncrasies of a French church, a Chinese pagoda, Hong Kong's Tiger Balm Gardens and Madame Tussaud's Wax Museum." To say that this huge church is outrageously colorful and ornate is an understatement. Our group arrived a little before noon. From the balcony, we viewed the procession and prayers of hundreds of priests and followers, dressed in long colorful robes, mostly white but also lots of red, blue and yellow. The orchestra played mysterious, pentatonic scale music on their traditional string and wind instruments. That evening I had dinner with Hiromi and Mimiko, two cute tourists from Japan. We found a traditional Chinese restaurant and had desert at a French pastry shop. Yes. My first days in Vietnam have been delicious and colorful and surprising. And social.